Stainless Steel Travel Mugs, Customized, Promotional, Printed. AR1772 Stainless Steel Travel Mug - 14 0z. with Push on/twist open black plastic lid. Screen Imprint Area: Side 1:2-1/2"H x 2-1/2"W. Side 2: 2-1/2"H x 2-1/2"W. Wrap: 2-1/2" x 7-3/4"
Price includes one color silk-screened imprint on one or two sides. Unless specified, orders will be set-up as one sided imprint for right-handed use. For plastic thermal mugs, click here. Artwork charges, requirements to prepare and to e-mail artwork to us, click here. Set-up charge: $50.00 per color per design. Registration will vary 1/8" in any direction making close registration impossible. Random samples: $15.50 to cover shipping & handling (Refundable with first complete order). For more Drinkware, click here. Back to ARMU home page, click here. Ink Color Match (Pantone PMS): $40.00 per color. Exact color match can not be guaranteed. Requirements to prepare and to e-mail artwork, click here. Proofs: $12.50 each. Product proof $60.00. Mailers**: 1 PC $1.40; 2 PC $3.75 • Gift Boxes**: 1 PC $1.10. Shipping: FOB factory or warehouse. We will use our discretion as to the best method ( UPS or truck) to be used. Please call us for approximate freight charges when ordering. Production Time: From receipt of complete order and approved artwork, please allow approx.13-14 working days production time in the plant on custom or imprinted merchandise, unless otherwise noted. Overruns/ Underruns: We reserve the right to ship and bill 5% over or under the ordered amount on custom imprinted merchandise. 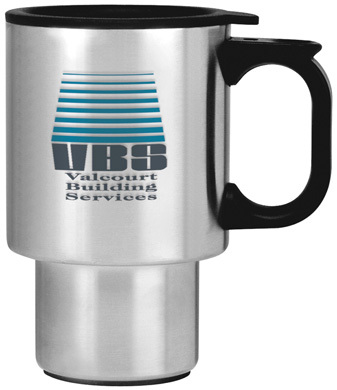 Order your Custom Imprinted Super Saver Stainless Steel Travel Mug NOW and save time and money!